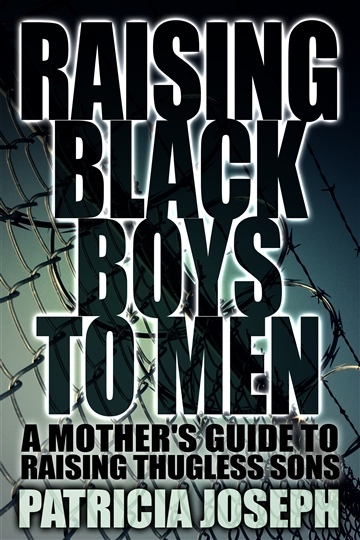 “Raising Black Boys to Men: A Mother’s Guide to Raising Thugless Sons” is a candid book of one mother’s journey: her successes, trials, and errors, in raising her three boys, in a society that glorifies thug-life. Also, readers will come to understand the unique challenges African-American mothers’ face, with raising their boys. Patricia takes no prisoners, when she writes about the incarceration rates, and illiteracy of young, Black men. At the end of the book, Patricia provides readers with a list of “Recommended Reading,” as a supplement to further their knowledge and increase awareness. Patricia Joseph is a wife, mother of three sons and a daughter, writer, and web communications specialist. She is committed and passionate about building stronger families. She earned her B.S. in Journalism from the University of Massachusetts, at Amherst. When she’s not developing her writing craft, Patricia spends her time relaxing with hubby, gardening, listening to jazz, or cooking. An exceptional home cook, vegetarian, and natural lifestyle enthusiast, Patricia loves sharing information and her passion for food and healthy living, on her Eat Well and Live Healthy blog (http://eatandlivehealthy.wordpress.com). Visit Patricia’s blog: http://raisingblackboystomen.wordpress.com, to read her insights and share your views on Raising Black Boys to Men.